One of the biggest concerns with this process is that it could become an entryway for contaminants to enter the process. Everyone remembers the story of a high-profile biologics company that had a facilitywide animal virus contamination, and how it resulted in shortages of vital medicines and a long shutdown to determine the root cause. To reduce the chances of such contamination, the entire system must be closed. 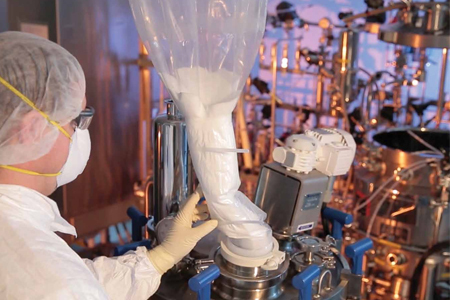 Making biologics safely also means designing the process to reduce contamination risk at every step, even those that may not seem obvious. One of those often overlooked steps is mixing media and buffer powder during the process. It is still common to see people pouring open buckets of powdered media into a mixing tank, with powder flying into the air and around the room. This leads to a dirty environment that is hard to clean and validate. We have found a way to make this process seamless, easy and safe, using a system that is the state-of-the-art solution in single-use facilities.